The reason I originally signed on to be a Daring Baker was reading about the gateaux St. Honore that they made in May of 2007. I looked at these gorgeous, complex creations—rings of homemade puff pastry lined with caramel-coated cream puffs and filled with chiboust cream—and thought, “Could I do that?” Since then, I’ve made most of the elements of that gateau St. Honore at one point or another, but this croquembouche somehow seemed the most like it to me, so I was really excited to get started on it. 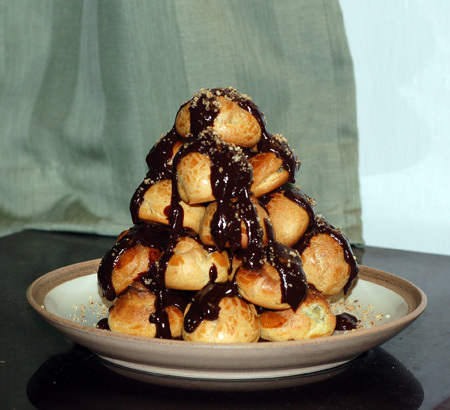 A croquembouche (meaning “crunch in the mouth”), or piece montée (or “mounted piece”) is a tower of cream puffs, usually glued together and decorated with caramel, but occasionally chocolate. 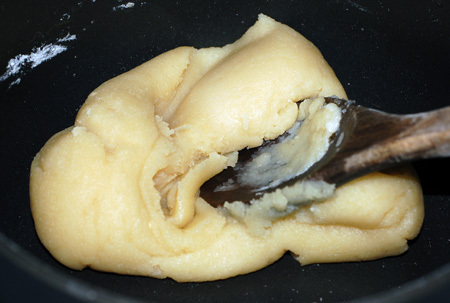 The first step in making one is mixing a pâte à choux, a soft egg-enriched dough that is partly cooked on the stovetop. I’ve made this once before, for the éclairs challenge in August of 2008. The dough came together in a very similar fashion, although this time the recipe called for beating the dough with a wooden spoon rather than a mixer, and my arm got a good workout. My éclair shells, however, mostly deflated after being baked, which made them difficult to split and fill. This time I held my breath as I piped out 1″ rounds of dough, brushed them with egg wash, and put them in the oven. The batter had flattened slightly by the time I finished piping the whole tray, but it didn’t seem to affect the finished cream puff shells. They puffed up into little golden balls, and I believe the step that called for lowering the oven temperature to 350F after the initial rise helped them to set in that shape rather than deflating again. I will definitely go this route for baking my choux pastry in the future. More confident now, I gave the tray a few minutes to cool, reset the oven temperature to 425F, and piped out the last few puffs. This was about the point when my sketchy oven decided it was done. I’ve been having periodical issues with temperature control errors, caused, I believe, by the computer board in the oven glitching rather than the oven itself. A few weeks ago, it successfully baked a pile of thin wheat crackers, then immediately proceeded to turn a baked salmon dish into charcoal in moments, almost as if the self-cleaning cycle had been activated. I got the second batch started at 425F, checked on them after about 12 minutes and turned the temperature down to 350F again. A few minutes before the timer went off, I took a peek to check on their progress, and was horrified to see that they were on the verge of burning. I whisked them out of the oven, which, according to the analog thermometer inside, was still over 400F, turned the oven off, and ended up gingerly scraping most of the charred bits off the tops. After about 15 minutes, I realized that the oven filament was still red-hot and the analog thermometer was past maxed out at 600F. With smoke starting to pour out the appliance, I ended up having to unplug the thing to get it to cool down. Unfortunately, it just starts superheating again whenever I plug it back in, so now I can’t really even use the range. A new oven is almost certainly in my future, but for the moment, my kitchen has come to a virtual standstill. 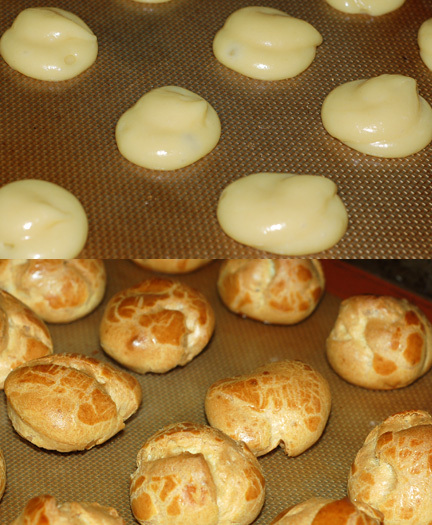 Fortunately, I made the pastry cream filling before baking the choux puffs, so that it would have some time to set up in the refrigerator. I didn’t use the recipes provided by Cat because I am out of cornstarch, so instead I used a Julia Child recipe for vanilla pastry cream and tweaked the flavorings. This recipe worked out really nicely for me: you beat together sugar and egg yolks, then stir in flour for what amounts to a sweet roux, which blends into warm milk without too much concern about scrambled eggs or lumps. I flavored the lot with vanilla, then divided it in half. On the right, I added a small handful of semi-sweet chocolate chips to the hot cream to make chocolate pastry cream; on the left, I made a batch of hazelnut praline and ground it into powder to mix with the vanilla cream. I had fully intended to use caramel to glue my croquembouche together and create an elegant garnish of spun sugar. I love the look of the golden caramel strands, and thought the chocolate and praline fillings would be complemented nicely with its flavor and crunch. However, when my oven died, I decided it would be best not to press my luck, and ended up making a batch of ganache in the microwave instead. (1 part heavy cream, heated to a simmer, then poured over 3 parts chocolate and stirred until thick and shiny.) 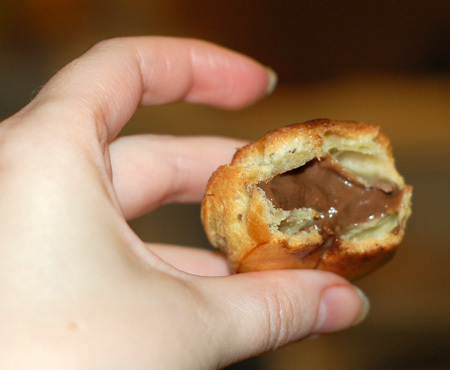 The ganache made stacking my filled cream puffs difficult, as they tended to slide around a lot. I ended up securing the two base layers with toothpicks as well, and then the rest cooperated long enough for me to stash it in the refrigerator to solidify. Well, it didn’t end up anywhere near as elegant as what I had envisioned in my mind. The ganache was on the gloppy side, but at least it tasted good. The shells were crisp and light, and both fillings were delicious, so it was still a great dessert. 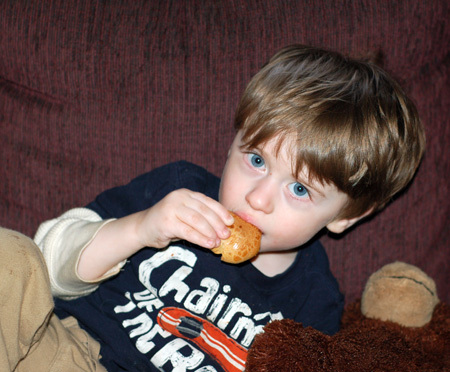 My son knew instantly that it would be good—he saw those choux puffs cooling on the countertop and was continually trying to sneak samples, since he is now tall enough to reach without assistance. I let him snack on an empty one before our pizza arrived (the emergency dinner plan; now I just have to figure out how to cook a whole chicken without an oven), but the little chocoholic liked them even more filled with cream and dunked in ganache. Thanks so much to Cat for selecting this challenge. I made my first really successful choux puffs despite my oven’s sabotage attempt, and one day I’ll make one with the caramel (maybe at Christmastime—the thought of a croquembouche Christmas tree is awfully appealing). We’ve got a beautiful piece montée waiting to be dismantled in the fridge, and a few extra shells that I’m contemplating using for a savory filling, providing I can find one that doesn’t need the oven. 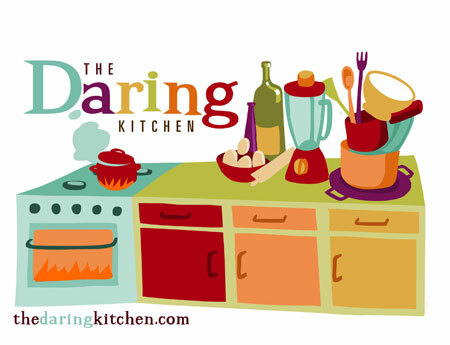 And be sure to check out all the spun sugar goodness at the Daring Bakers Blogroll. Preheat oven to 425F. Line two baking sheets with parchment paper or silicone. Combine water, butter, salt and sugar in a saucepan over medium heat. Bring to a boil and stir occasionally. At boil, remove from heat and sift in the flour, stirring to combine completely. Return to heat and cook, stirring constantly until the batter dries slightly and begins to pull away from the sides of the pan. Transfer to a bowl and stir with a wooden spoon 1 minute to cool slightly. Add eggs one at a time, beating thoroughly between each addition. The batter will appear loose and shiny at first, then more like lightly buttered mashed potatoes, and finally will become yellowish and creamy. Transfer batter to a pastry bag fitted with a large open tip. Pipe choux about 1 inch apart onto the baking sheets. 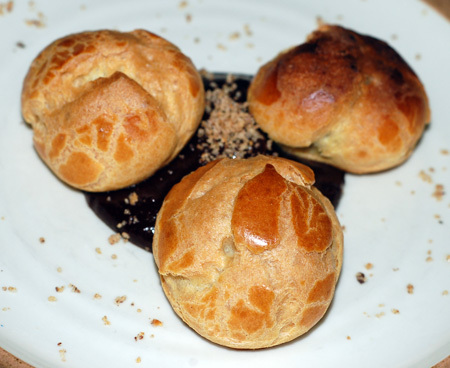 Choux should be about 1 inch high and about 1 inch wide. Using a clean finger dipped in hot water, gently press down on any tips that have formed on the top of choux when piping. You want them to retain their ball shape, but be smoothly curved on top. Brush tops with egg wash (1 egg lightly beaten with pinch of salt). 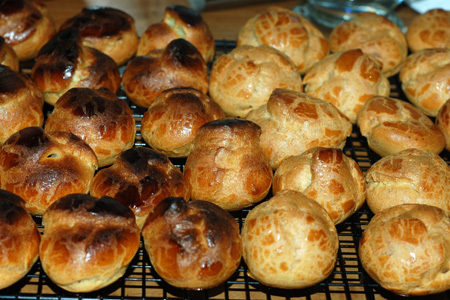 Bake the choux at 425F until well-puffed and turning lightly golden in color, about 10 minutes. Lower the temperature to 350F and continue baking until well-colored and dry, about 20 minutes more. Remove to a rack and cool. Can be stored in a airtight box overnight. Heat the milk in a small saucepan. Meanwhile, beat the egg yolks in a larger heavy-bottomed saucepan and gradually pour in the sugar, beating well until thick and pale yellow. Beat in the flour and mix thoroughly. By dribbles, beat in some of the hot milk, reserving 1/4 of the milk. Stir custard mixture over moderately high heat, whisking continuously. Lumps may occur; beat vigorously to smooth. You want the pastry cream to be very thick, but use remaining milk to thin if necessary. Lower heat and stir for 3 more minutes. Remove from heat and beat in the butter, flavoring, and salt. Cover with plastic wrap on top and chill for 3 hours. Looks absolutely delicious!! And the pic of your son eating one is just great 😉 I also loved this challenge, not too dificult (if your oven is working with you 😉 ) and just mouth watering great tasting!! Regards from Spain!! Looks delicious! Great job! Your son is really cute!